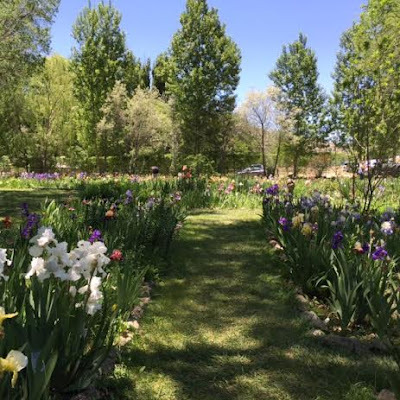 We Went to the Iris Farm! 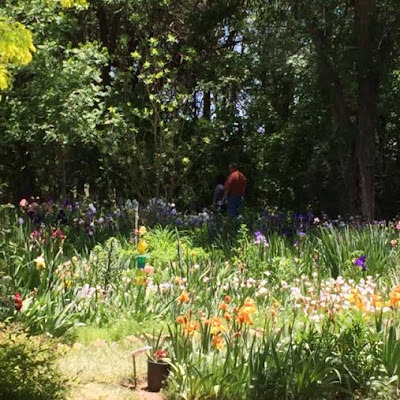 I've always wanted to take a trip to the Hondo Iris Farm, located a couple of hours away from Las Cruces in the Hondo Valley of New Mexico. Today we combined a visit there to see the irises in bloom with a picnic on the grounds. Lovely! 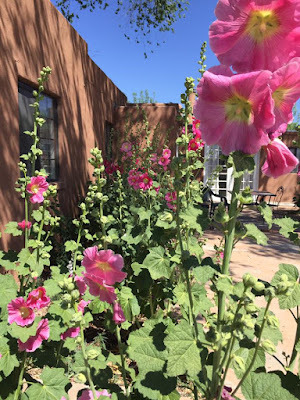 We drove to the other side of the Organ Mountains, through the Tularosa Basin, up into the Sacramento Mountains, and through the mountain town of Ruidoso. Along the way we passed a missile base test facility, the White Sands National Monument, the Mescalero Apache Reservation, the Inn of the Mountain Gods Resort and Casino, the Hubbard Museum of the American West, and the Ruidoso Downs Race Track. Scenery-wise, we traveled from the pecan orchards and chile fields of our own irrigated Mesilla Valley, through bare rocky mountains, along a desert road through ancient lake beds, up through some pine tree mountains, and down through some very barren and dry hills to the place where the Hondo Valley starts. Oh, that Hondo Valley! It hit these desert eyes with a big blast of green, just like the oasis it is in a dry land. 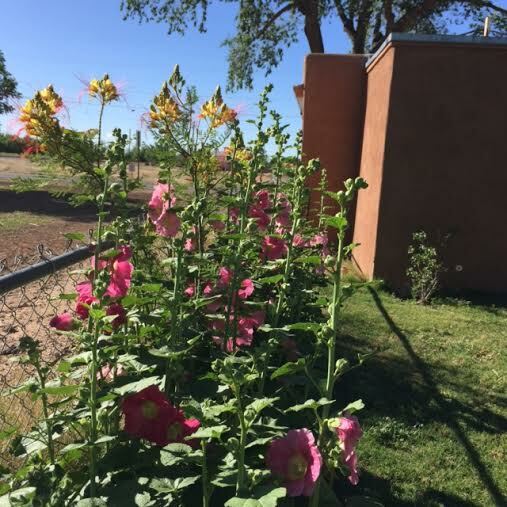 The waters of the Rio Hondo, Rio Bonito, and Rio Ruidoso meet here and irrigate the grazing fields, orchards, and vegetable farms in that good bottom land. 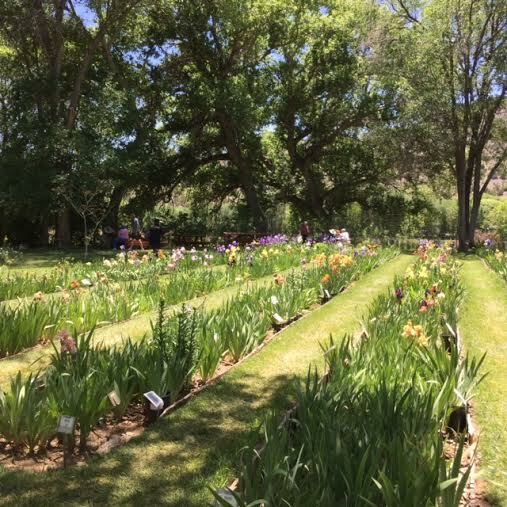 After passing by the little villages of Glencoe and San Patricio, we came to Hondo and took the turnoff into the grounds of the Hondo Iris Farm. The pictures below should tell the rest of the story. 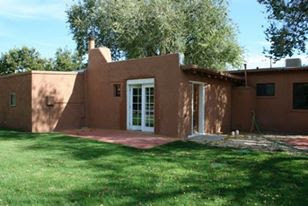 There were lots of shade trees, always appreciated by New Mexicans. I love the contrasting foliage of these trees. some hollyhock seedlings, and peonies. The fragrance was wonderful. 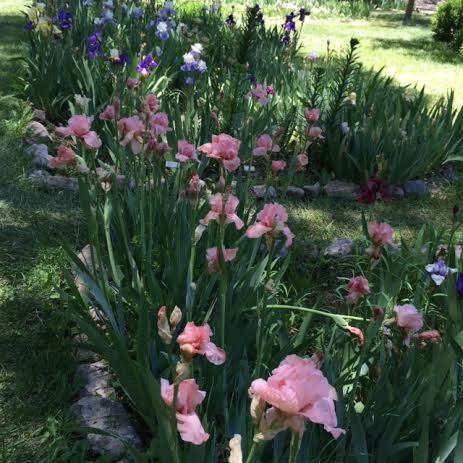 Not such a good shot of the flowers, but we always love the shade! 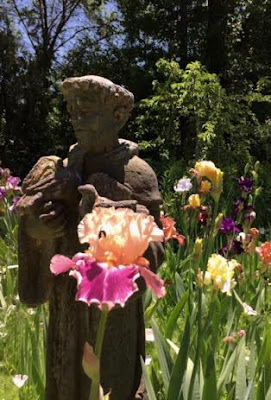 St. Francis, being dwarfed by a huge iris bloom. I brought home several potted irises and a peony for our own garden. I loved our peonies back in New Hampshire and somehow never realized that they can be grown here. 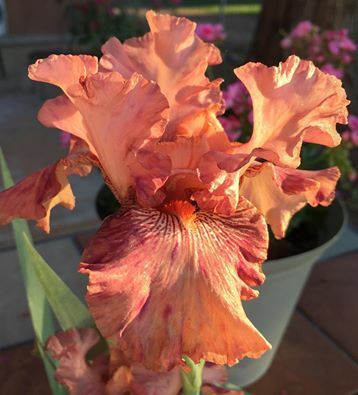 We also brought home a catalog and I'll be choosing more iris varieties to pick up from the farm in July. I guess I have some digging to do to make some beds out back for the new plants. 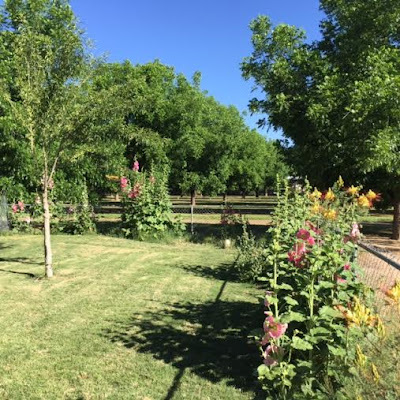 I think our chicken girls will enjoy the view of all those blossoms next year. Our backyard was just a plain expanse of green grass when we first moved in. Since then, we've added the chicken coop and run, some new raised beds, a fence to divide off a section from the dogs, and a border for flowers. ... where they've shot upwards of eight or nine feet, almost overpowering the flamboyant desert bird of paradise trees that are planted nearby--look closely for the yellow and red flowers to the left in the photo above. In this planting along the side fence, the bird of paradise looks to be winning the competition. 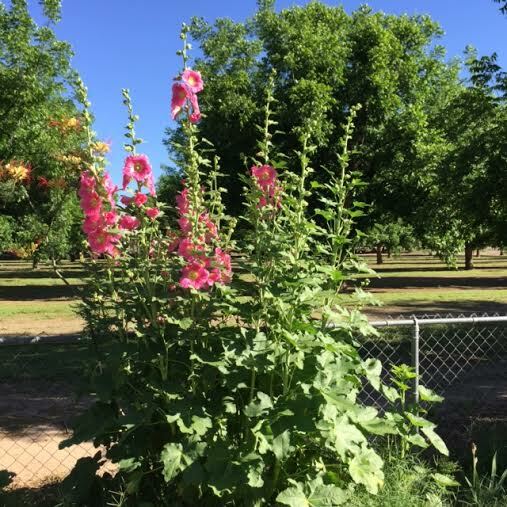 Elsewhere in the garden (not shown) there is a blue vitex (Texas lilac) that is co-existing with some other pink hollyhocks. Together, they will make a lovely color combination once the vitex gets taller than the hollyhocks. 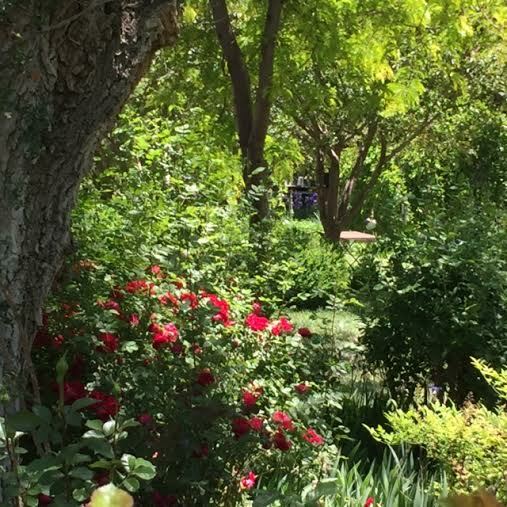 We are so lucky to be surrounded by a pecan orchard that gives us a continual cool green backdrop in the summer. 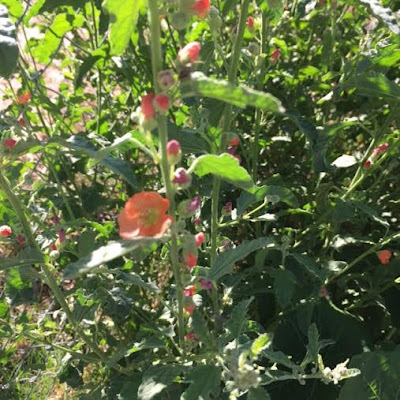 For the second year now, this sweet apricot-colored native globe mallow has volunteered its blossoms in among the other plants. 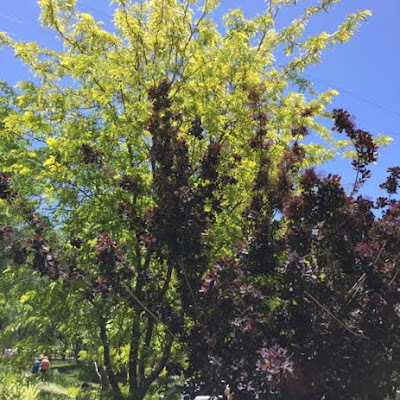 With very little water and a bit of pruning it will rebloom later in the season. 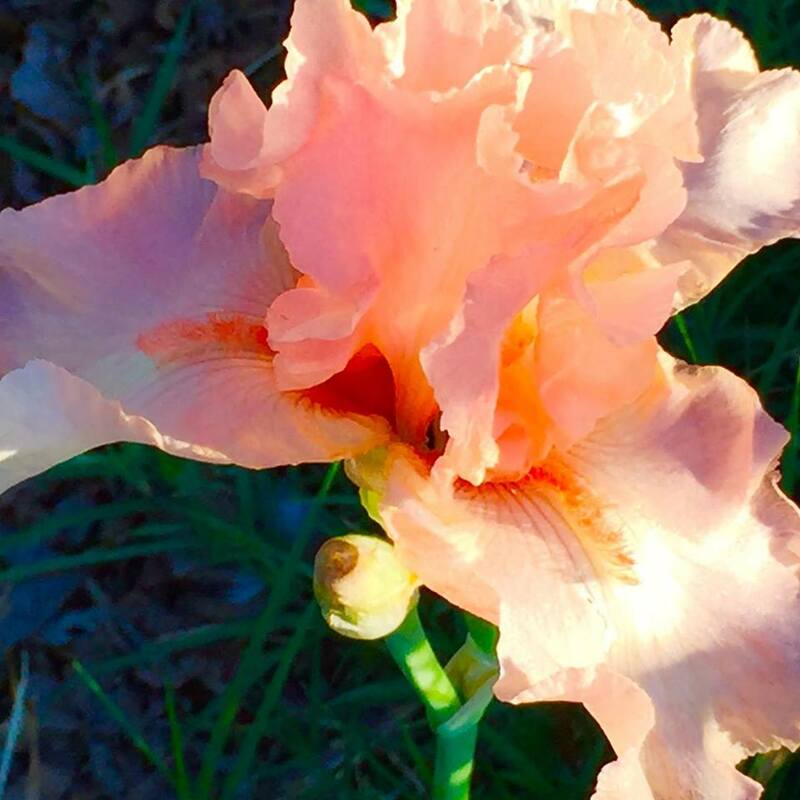 And for the very first time, this Beverly Sills iris has bloomed after I moved it to a better spot. 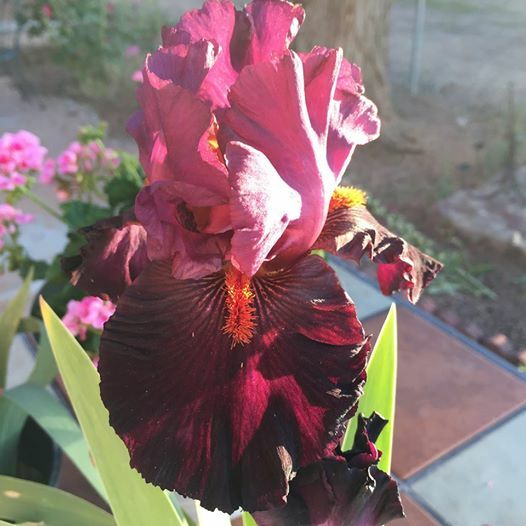 For some reason, I've had little success with irises, but this beauty has made me want a field trip to the Hondo Iris Farm near Ruidoso, New Mexico. I hope to bring back a few irises in pots and a catalog to order some more. Ruby colors! Blues! Yellows! 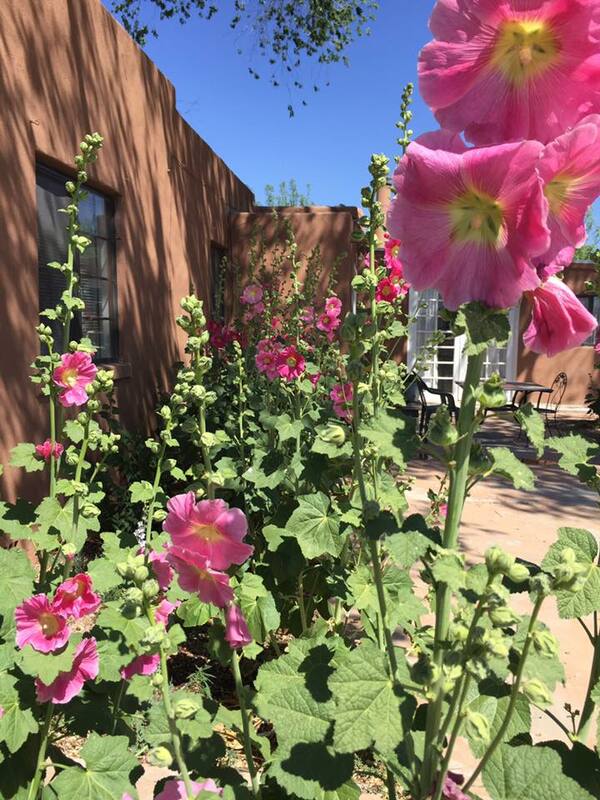 Everything that has been planted so far requires just a minimum of water, a good thing in this desert climate. While the long-range plan is to leave a bit of grass for dog romps, we are slowly reducing the size of the lawn in favor of xeriscape-type (drought-tolerant) plants.